Archer’s unique ComTrac carbon composite rod system continues to break records for horizontal perforating. Modern completion practices designed to maximise productivity, such as long horizontal drain sections, can be challenging to execute. A recent job requiring extended perforated intervals in a horizontal section exceeding 800m in length was completed in only 5 runs using ComTrac in combination with a downhole tractor device. The longest perforating string included no fewer than 15 fully loaded 2-7/8” guns, orienting weights to ensure optimum charge placement, decentralising devices and shock absorbing assemblies. A bottom-hole assembly of 140m length, including the tractor conveyance tool, and weighing 3,300kg was conveyed along an 830m horizontal section with a maximum angle of 92 degrees. The total interval perforated on this single run was 105m from top to bottom shot. In all, well over 400m of pay was perforated using 55 guns in a total of 5 runs in hole, an interval that would have taken 18 runs using conventional wireline techniques. Archer’s ComTrac system reduced the total operating time from 9 days to 2.5 days. 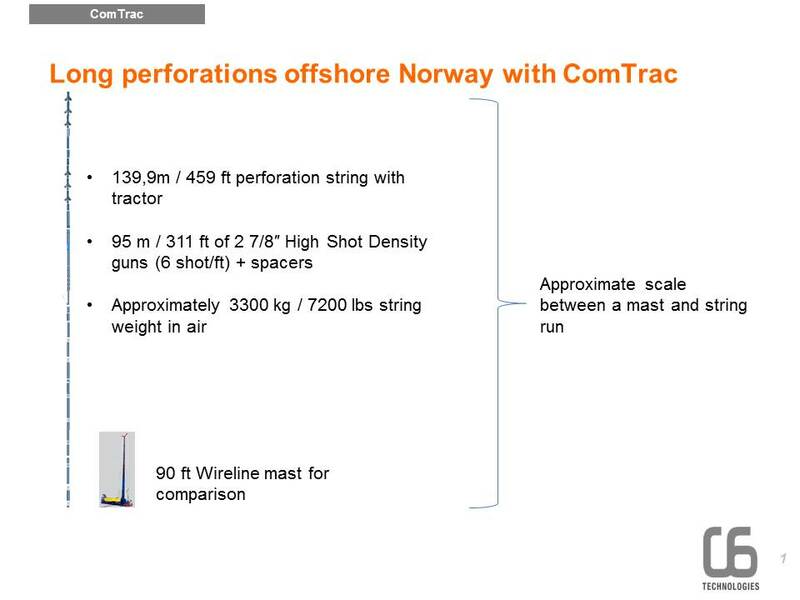 The operational risk associated with perforating an oil well is directly related to the number of runs required; so as well as saving significant time ComTrac operations reduce the possibility of a ballistic misfire or tractor conveyance problem leading to a greatly improved risk profile.